Let's have some fun on this Friday eve. I'm talking about stripes and polka dots. 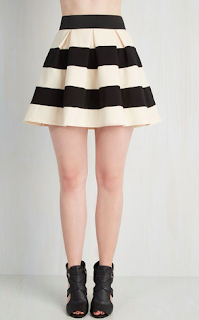 A fun way to round out the week and we're doing it with skirts. Flirty, fun, and downright fantastic prints. Oh hello fun. Perfect box pleats, thick monochrome stipe, nothing better. Have you met Shabby Apple? It's retro, boho, anther, chic, and so many options are under $100. And please check out the tulle on this skirt. This skirt is a four season one. Pair it with tights in the winter and boots in the fall. Perfect texture for all year round. Perfectly ladylike. I love this skirt for work or date night. 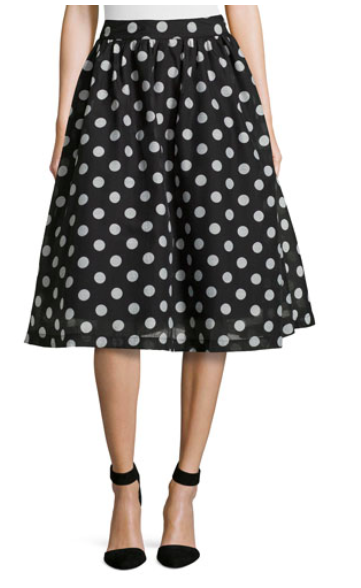 Sometimes you just want a fun and flippy skirt and let me tell you, these fit the bill. Dots, stripes, a line, circle, you name it, these skirts just work.